Mayon Volcano in the Philippines has a symmetrical volcanic cone. 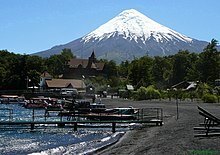 Osorno volcano in Chile is an example of a well-developed stratocone. Koko Crater is a tuff cone that is part of the Honolulu Volcanic Series. Parícutin is a large cinder cone in Mexico. Cinder cones most commonly occur as isolated cones in large basaltic volcanic fields. They also occur in nested clusters in association with complex tuff ring and maar complexes. Finally, they are also common as parasitic and monogenetic cones on complex shield and stratovolcanoes. Globally, cinder cones are the most typical volcanic landform found within continental intraplate volcanic fields and also occur in some subduction zone settings as well. Parícutin, the Mexican cinder cone which was born in a cornfield on February 20, 1943, and Sunset Crater in Northern Arizona in the US Southwest are classic examples of cinder cones, as are ancient volcanic cones found in New Mexico's Petroglyph National Monument. Cone-shaped hills observed in satellite imagery of the calderas and volcanic cones of Ulysses Patera,  Ulysses Colles  and Hydraotes Chaos  are argued to be cinder cones. Wikimedia Commons has media related to Volcanic cones. ^ a b c d e f g Poldervaart, A (1971). "Volcanicity and forms of extrusive bodies". In Green, J; Short, NM (eds.). Volcanic Landforms and Surface Features: A Photographic Atlas and Glossary. New York: Springer-Verlag. pp. 1–18. ISBN 978364265152-6. ^ a b c d e f g h i Schmincke, H.-U. (2004). Volcanism. Berlin, Germany: Springer-Verlag. ISBN 978-3540436508. ^ a b c Wohletz, K. H.; Sheridan, M. F. (1983). "Hydrovolcanic explosions; II, Evolution of basaltic tuff rings and tuff cones". American Journal of Science. 283 (5): 385–413. Bibcode: 1983AmJS..283..385W. doi: 10.2475/ajs.283.5.385. ^ Sohn, Y. K. (1996). "Hydrovolcanic processes forming basaltic tuff rings and cones on Cheju Island, Korea". Geological Society of America Bulletin. 108 (10): 1199–1211. doi: 10.1130/0016-7606(1996)108<1199:HPFBTR>2.3.CO;2. ^ Brož, P.; Hauber, E. (2013). "Hydrovolcanic tuff rings and cones as indicators for phreatomagmatic explosive eruptions on Mars". Journal of Geophysical Research: Planets. 118 (8): 1656–1675. Bibcode: 2013JGRE..118.1656B. doi: 10.1002/jgre.20120. ^ Plescia, J.B. (1994). "Geology of the small Tharsis volcanoes: Jovis Tholus, Ulysses Patera, Biblis Patera, Mars". Icarus. 111 (1): 246–269. Bibcode: 1994Icar..111..246P. doi: 10.1006/icar.1994.1144. ^ Brož, P.; Hauber, E. (2012). "A unique volcanic field in Tharsis, Mars: Pyroclastic cones as evidence for explosive eruptions". Icarus. 218 (1): 88–99. Bibcode: 2012Icar..218...88B. doi: 10.1016/j.icarus.2011.11.030. ^ Meresse, Sandrine; Costard, François; Mangold, Nicolas; Masson, Philippe; Neukum, Gerhard; the HRSC Co-I Team (2008). "Formation and evolution of the chaotic terrains by subsidence and magmatism: Hydraotes Chaos, Mars". Icarus. 194 (2): 487–500. Bibcode: 2008Icar..194..487M. doi: 10.1016/j.icarus.2007.10.023. ^ Wentworth, C., and G. MacDonald (1953) Structures and Forms of Basaltic Rocks in Hawaii. Bulletin no. 994. United States Geological Survey, Reston, Virginia. 98 pp.